Back in the 1980s, there used to be a popular CRPG series that would vie in popularity with the two titans, Wizardry and Ultima. That was SSI's Phantasie, designed and coded by Winston Douglas Wood, who also co-designed (with Eric Liebenauer) another SSI-published CRPG, Star Command. Today we present you our interview with the man himself. The West saw Phantasie as a trilogy, but actually - and this is major news that hasn't been known before - WD Wood went on to design Phantasie IV after Japanese company Star Craft, Inc., approached SSI for a publishing deal. Unfortunately, as the interview tells us, Winston didn't have the time to adapt the fourth game to non-Japanese PCs, so SSI never published it in English and it has remained a Japanese exclusive. In other news, old-time Phantasie fans will also be excited to find out that Winston is currently working on a Phantasie V in his spare time! We'll be sure to keep you informed about the game's progress. Phantasie made use of passive skills during exploration to inform the player of such things as traps, hidden treasure and upcoming monsters. These features were rare at the time and are still rare today. How important do you think these mechanics were in terms of the overall gaming experience? Did you have any ideas for further skills that failed to make it into any of the games? Those skills came from RuneQuest and D&D. They encourage the player have a greater variety of characters so that all of these skills are well balanced in their party. To imagine that your characters are listening for monsters and searching for traps gives a greater sense of realism and danger that was typically more present in tabletop games. I would have liked to have added rock climbing to Phantasie and generally make better use of the other skills but time and resources prevented that. In 1990 Phantasie IV was released exclusively in Japan for MSX, NEC and Sharp computers. The game credits you as the creator of the series, but the actual development is credited to a Japanese company called Star Craft, Inc. What do you know about this game and did you have any involvement in it at all? I designed Phantasie IV completely. I was able to go to Japan and meet the programmers from Star Craft but I was never able to test the game to any extent. I did consider doing another fantasy RPG but decided to do Star Command instead. That's exciting to hear! Did you design Phantasie IV specifically for Star Craft, or have you already had it designed (for SSI perhaps) by the time Star Craft approached you? And why wasn't it published in the West? Starcraft approached SSI with the idea of doing Phantasie IV in Japan. SSI then contacted me and I designed the game. SSI would have published it if anyone had been available to adapt it to computers like the Apple II or Commodore 64 but that never happened (I was busy designing and programming other software). As far as I'm aware you left the industry at some point after the release of Star Command. What was the reason for your departure and what have you been up to since? After Star Command I designed three games for Japanese companies. I thought designing the games without doing the programming would give me a chance to improve graphics quality and game play. However only one of the games (Phantasie IV) actually made it to the market and I found that I missed the opportunity to interact with the games during the design process. At the same time I was given an opportunity to do some programming for a civil engineering software company (KYPipe, LLC). This proved to be a more stable source of income since sales of one product would continue for years instead of just a few months. I am still in that field to this day as part owner of KYPipe, LLC. By the way I am currently working on Phantasie V. I don't get much time to work on it so its a very slow process. If you want you can check back with me in about a year and I will let you know the status of the project. We will be sure to! Can you maybe tell us a bit about how you approach it? Will it look and play similar to the previous Phantasie games, or are you aiming for something new with it? It is still very early in the development stage and it's really just for fun right now. I haven't given any thought to publishing. It will be a PC game though if it turns out well I may consider Android and IOS versions. Be sure to read the full interview. After a steady start, computer role-playing games came into their own in 1985. Origin Systems revamped the Ultima series with Quest of the Avatar, Interplay revealed their own take on Wizardry with The Bard's Tale, and SSI finally climbed on board the cRPG train with Wizard's Crown, a precursor to the legendary Pool of Radiance, and Winston Douglas Wood's Phantasie. 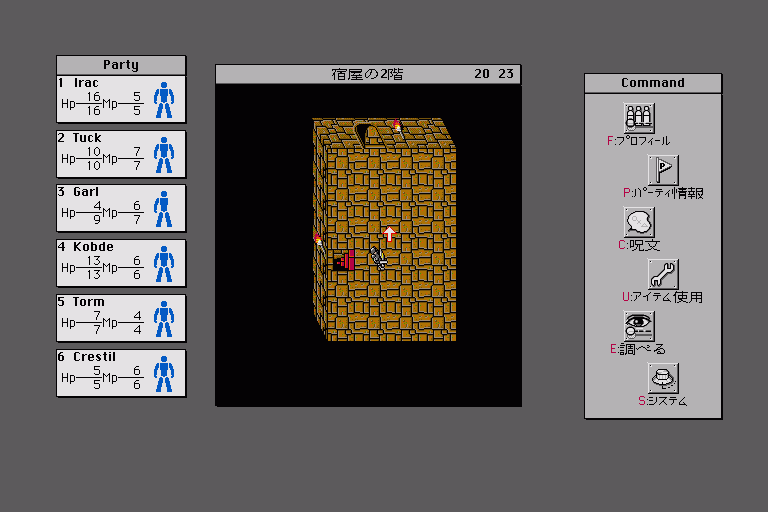 Phantasie (1985) can best be described as a dungeon crawler, but with multiple dungeons, towns and wilderness areas. Unlike many of its contemporaries, it features a top-down view in which the geography is revealed incrementally through exploration, acting as an auto-map. The game's combat is similar to Wizardry in that it is phase-based and lacks character movement, but it contains a number of attacking options such as thrusting, lunging and slashing. Its other stand-out features include its fifteen different races, its use of passive skills during exploration, and its puzzles, dungeon events and text descriptions that add vibrancy and variety to proceedings. 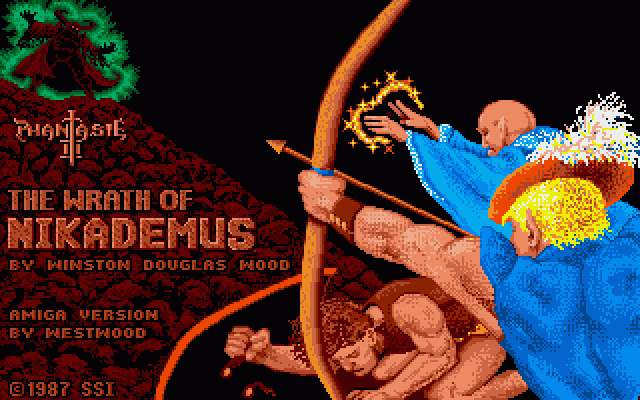 The game spawned two in-house sequels, with the second being one of the first cRPGs to feature locational damage. Star Command (1988) is a different beast - a sci-fi cRPG that, while retaining the classic dungeon-crawling aspect, moves on to simulate an open world space environment, striking a good balance between missions and exploration. It features an eight character party, a Traveller-esque character generation system with four different classes, each with its own class-exclusive skills, and compelling character development with a lot of choice and an involved training process. There are two different combat systems, one for space battles and one for land battles, both turn-based. Positioning matters in both, making the combat fairly tactical, and the missions can get quite challenging and rewarding. Overall Star Command is definitely a unique space cRPG, with excellent character development, level design and atmosphere. With the Gold Box D&D games stealing the hearts of cRPG fans everywhere, Winston's games fell into relative obscurity. But this is the Codex and obscurity doesn't faze us, so here's our interview with the man himself. According to your LinkedIn profile, you were working towards your master's degree in computer engineering at about the same time you worked on the first Phantasie. How did you get involved in video game development at this time? How did you end up working with SSI? How was your relationship with them and did you have any difficulty pitching your game ideas to them? What influence did they have on the design and development of your games? These days it's normal for computer RPGs to take inspiration solely from other computer RPGs, but back in the mid-80s there weren't that many around to gain ideas from. How much were you inspired by older games such as Wizardry and Ultima, and how much were you inspired directly by tabletop RPGs such as D&D? What did you want to achieve from the creation of Phantasie? Were there things that you wanted to introduce to computer RPGs that hadn't even been approached by other games? What did you feel was missing from the genre or video games as a whole? Phantasie combined Tolkien-like fantasy with classical Greek mythology. What motivated this eclecticism and, in your opinion, were the results satisfactory? Furthermore, from where did you draw inspiration for Nikademus? Unlike the majority of 80s computer RPGs, Phantasie attempted world persistence by saving the state of each dungeon. Was this a deliberate attempt to fix what you saw as a major design flaw in other games? How technically challenging was the dungeon saving to implement? Dungeon events often challenged players to make decisions from morally ambiguous options. One such example was between saving a "beautiful maiden" and a "distinguished man" from a lava filled room, each giving different rewards. Was this ambiguity an intentional part of your game designs? Which was your favourite of these dungeon events? Many computer RPGs at the time, such as Wizardry and Ultima, stuck to first person dungeon exploration which made navigation an issue. Your games took a completely different approach, having top down exploration that slowly revealed more of the map. How did you come up with this design and what were your inspirations for it? Looking back, do you think that this design was a stepping stone towards the widespread adoption of auto-mapping within the genre? Logic puzzles tend to show up at least once in every SSI RPG. The first Phantasie had the Dungeon of the Bleebs as its major logic puzzle. How big was the emphasis on these puzzles during the design and development of your games? How well do you think you integrated these puzzles with the RPG mechanics? In contrast to the first and third game, Phantasie II was neither released for the Amiga nor the IBM-PC. Why did SSI decide against porting it to these major systems? The third Phantasie game made a number of changes to the combat and more specifically the effects of combat. Individual body parts could receive damage, resulting in a proper injury system. Do you think this added complexity ultimately improved the game? What was your approach to balancing complexity and accessibility? Were you satisfied with the reception that the Phantasie series received? Did the games sell well, and if they did, why was the series discontinued? After the conclusion of the Phantasie series you worked on Star Command, a science fiction RPG. At the time, how did you feel about switching from fantasy and mythological themes to a science fiction setting? When were your ideas for Star Command first conceived? From what I have gathered, Star Command was an adaptation of a board game, presumably by Avalon Hill. Some sources mention that the board game was also called Star Command, but I have not been able to find anything concrete. If there was one, can you tell us a bit about it? 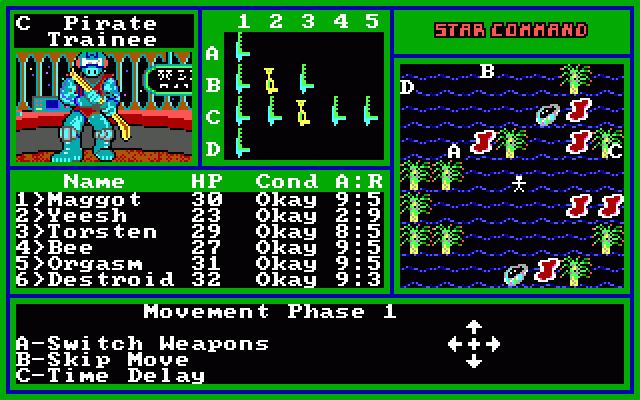 Star Command featured Traveller-esque character generation, with character training tied closely to mission progression. What were your goals for these systems? Do you think they turned out better or worse than the more traditional D&D style systems seen in Phantasie? Unlike your earlier games, Star Command featured two different combat systems; one for space battles and one for land battles. How did you go about designing the two of them to capture their differences, and which do you feel turned out the best? Why did you opt for turn-based space combat when most space RPGs at the time went for real-time? Star Command required careful balancing of its mission-based structure and its "open world" exploration. Certain missions were semi-random, and it was desirable to earn money through trading, capturing enemy ships and acquiring espionage items. How did you arrive at this combination of features? What attracted you to the semi-random missions? From today's perspective, some of the reasons to criticize Star Command are that NPCs are few and far between, planetary exploration is limited to a set of standard missions and the massive star map contains very little content for its size. Did you see any of these as problems while you were working on the game, and were you perfectly happy with the way Star Command turned out? Were there things that you wanted to implement but, due to technical limitations or time constraints, couldn't? The game tells you about three threats facing humanity – insects, pirates and robots – yet the game's story features only insects and pirates, with the robots having no story significance of their own. Was there originally supposed to be more to the robot sub-plot? If so, do you remember much about your plans for it? 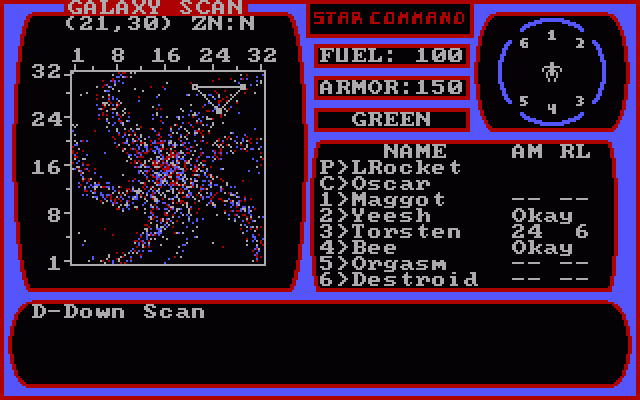 Star Command was one of the most fun, elegant and unique sci-fi RPGs of its era, with a lot of varied equipment, imaginative missions and well-designed complexes to explore. How would you describe the reception it received, and why do you think the game remained obscure? How do you feel about it today? Can you tell us a bit about Eric Liebenauer, who did the graphical design for Phantasie and, I assume, Star Command? How did you team up with him, and what was your experience of working together?